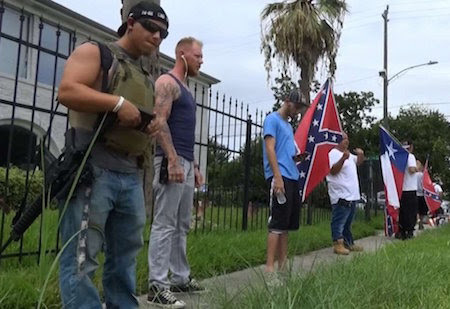 On Sunday, a small group of white supremacists brandished war weapons and waved confederate battle flags outside our Houston Branch offices. Their so-called “protest” turned a quiet, tree-lined street into a platform for hatred and violence. But in the face of flagrant bigotry and ignorance, the protestors in Houston were met by a larger crowd dedicated to peace and prayer. As activists, that’s what we have to do every day: Show the strength of our numbers, and our commitment to justice. We can’t allow the evil of the few dictate the fate of the many. Help strengthen our movement by becoming an NAACP member today. Unfortunately, for many of the NAACP’s 2,200 local chapters and branches, this kind of harassment is a regular occurrence, simply because we stand up for the civil rights of all people. These protestors in Houston are a distressing reminder of the hate that persists in our country and of the work we have ahead to eradicate it. For more than a century, the NAACP has built a multiracial, multigenerational force to nonviolently combat racism. We stand against violence, segregation, hate. We stand for voting rights, economic opportunity, professional and accountable law enforcement, and quality education. We always have, and we always will. You can judge what we stand for by who stands against us. If you stand with us, join us. Become a member of the NAACP today. The above appeal was sent out to the Peoples World by by Cornell William Brooks, the president and CEO of the NAACP.